I developed a GPS stabilised frequency reference that goes about disclipining an oscillator in a different way than most. 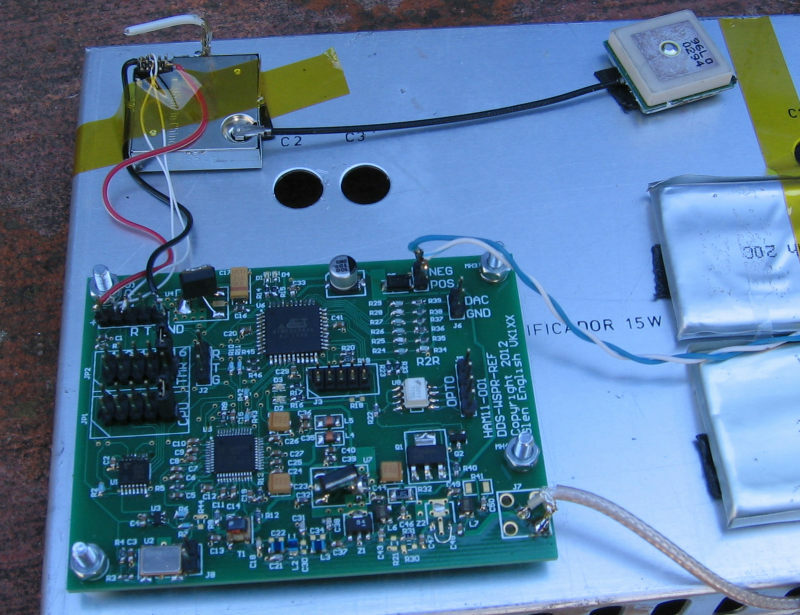 It can also function as a stand alone WSPR beacon. We will get a bunch of boards loaded for sale in the next few months. I have a handful of V1.0 blank PCBs (double sided, silkscreened , masked) if anyone wants them. Additionally, Inspired by other’s work, (VK3WRE/VK3ZYC), I will develop a very small and thin low noise DDS clock generator that uses a 10 MHz input and provides auto switchover to internal. It can generate ANY frequency for any radio. This can work in conjunction with any external timebase, 10 MHz being a standard. It will also fit in an FT817 without removing other plug in boards. demo setup for universal frequency reference – $4 oscillator is on the lower LHS. This entry was posted in comms. Bookmark the permalink. a little add-on SNTP or NTP server would make it even more awesome Glenn. Hi Glen, I am interested in the thin low noise clock generator to used in a LO. I wonder has there been any progress. I have been busy with a new born baby and sick mother, but I will be getting the next rev built by December. You seem to pose a question to Tim about ‘board size’, is this meant to fit within a radio? There is some spare room inside an Icom IC-910H radio to one side of the 1296 module and above the synthesizer area. PS. I can also ‘write code’ (as well as debug it) incl assembly. Thanks for your email. I am now almost on top of the newborn baby and I have a LITTLE more time. Could you provide details of the room available in the IC910 ? I will endeavour some compatability- though principally V1 will be an FT817 device. So, it looks like the 60mm x 80mm form factor board would work inside the IC-910H. The DSP units are optional in the IC-910H radios (they only operate on already-demodulated voice or audio signals). The sizes/area above were ‘sized’ with the optional 1296 module in place in the IC-910H, so there is plenty of room for an additional small board. There is even room on the rear panel for an SMA bulkhead connector to pass in 1 PPS or 10 MHz. Hi Glenn I wonder how this project is progressing.